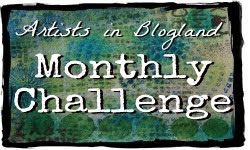 Artists in Blogland: Color This Quote - June Challenge! 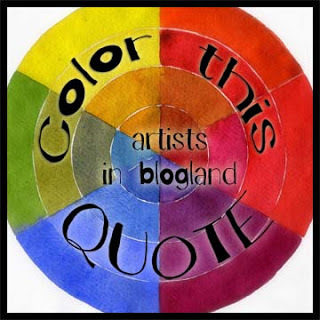 Color This Quote - June Challenge! 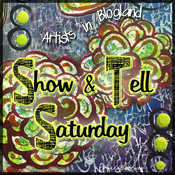 Hi Artists in Blogland! It's time for "Color This Quote - June!" This phrase was originally written as a prayer for Jerusalem, but it could be about any homeland, or home. What does it make you think about? What qualities do you wish for in your homeland or home? Last month's quote challenge ("Every act of creation is first an act of destruction," Picasso) resulted in lots of thoughtful entries about destruction and creation. Here are two examples, randomly picked! Monique wrote about how hard it is sometimes to create something on top of a background you've been saving. For the challenge, she forced herself to "destroy" the background to create something new. Ariel repainted a canvas several times, destroying the prior image, until finally feeling satisfied with this stunning portrait of two Rajasthani women on a textured background. Congratulations to everyone for making such beautiful art in response to April's quote! Grab the button and let people know you're participating! Link up your take on this quote in the Linky List below. It will be open until June 30, and sometime before July 1, the next quote will be revealed! Please link to a specific blog post or Flickr page, not your general URL. In your blog post, please let us know how your work relates to this quote. Sometimes it's hard to tell! Work that doesn't have a connection to the quote will be removed from the linky list, no matter how gorgeous it is, as we're trying to relate to the quote. Anything goes -- can't wait to see what you do with this quote. Have a great quote? Leave it in the comments section. I put all the suggestions on pieces of paper in a jar and let my daughter pick, so the more, the merrier. Thanks Jessica for that awesome quote it actually fits that pink house I just painted. I hope that's okay? Thanks for the link opportunity too. I love your pink house! SATS thats a cool abv. for Show and Tell! Im liking it :) Shared a painting for this months quote.